The original company in 2013 had over 40 people of all ages from the local community of York involved. 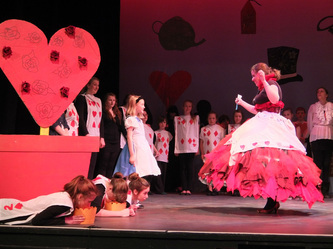 The Bridlington performance in Spring 2014 involved a live band, original cast members and people from the communities of Bridlington, Scarborough and Hull. The production was re-staged in York in June 2018 with a community cast of just over 70 members. If The Great Gatsby is unfilmable, as critics said before and after seeing Baz Luhrmann’s movie adaptation, then surely Alice In Wonderland is at least twice as unstageable. 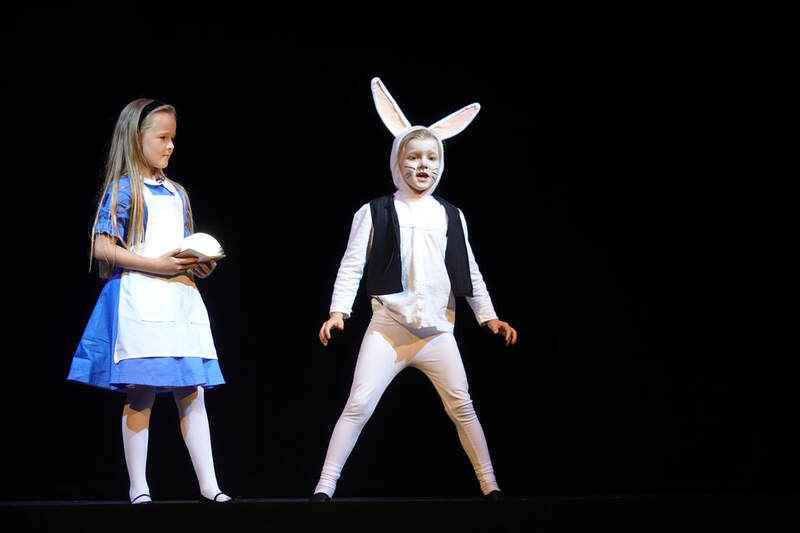 Even a West End theatre with a multi-million pound budget might struggle to convey Alice’s many telescopic transformations, her swimming in her own tears and the rest of Lewis Carroll’s mind-melting adventures. So how would We Are Theatre manage with far fewer resources at the Joseph Rowntree Theatre? 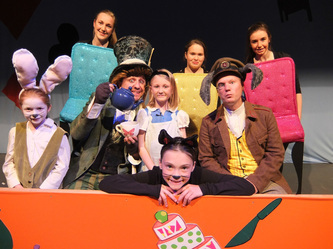 Thanks to a cast of extraordinarily talented young people, songs with real tunes and directors who made full use of the theme of the evening – imagination – Alice In Wonderland – The Musical was a treat. Ten-year-old daughter Mia and I had forgotten what a bonkers story this is. 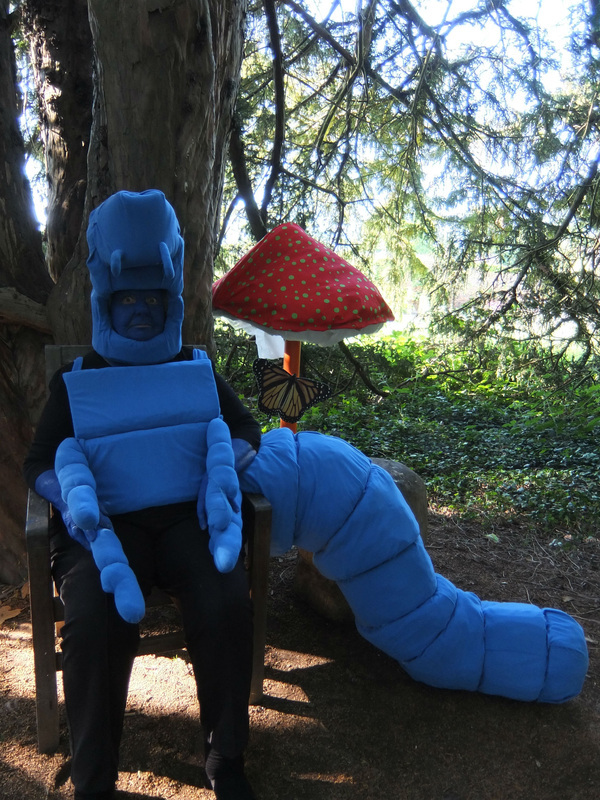 You get the feeling that Mr Carroll was smoking something stronger than his character the Caterpillar while creating such weird and wayward episodes. A lot rests on the shoulders of young Alice, on the stage throughout. 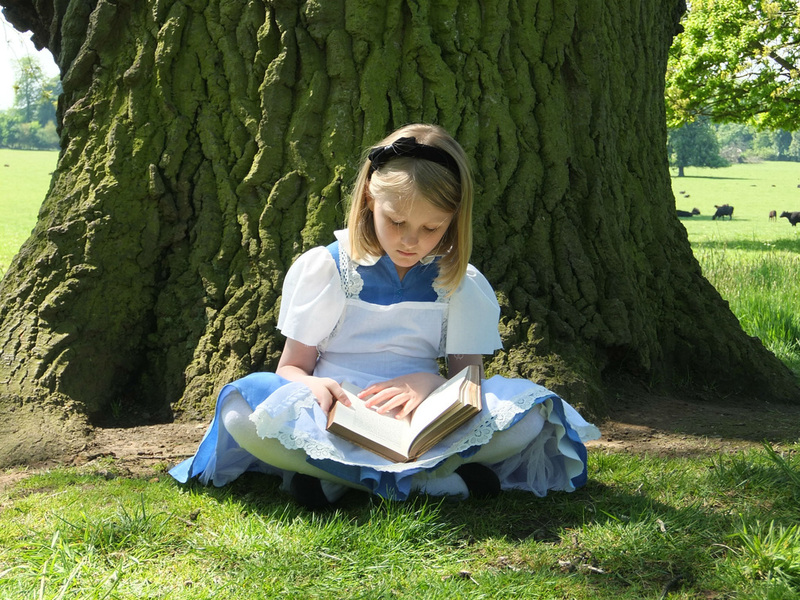 Eight-year-old Maggie Wakeling belied her years with a performance of astonishing maturity. She was the perfect Alice: fearless, smart, belligerent and vulnerable by turns. Maggie also has a lovely singing voice. In that she was equalled by an impressive number of note-perfect performances, notably by the Mouse (Amelia Cook), the Cheshire Cat (Fabienne Clarke) and the Book Keeper (Niamh Robinson-Wakefield). Great actors and singers all. 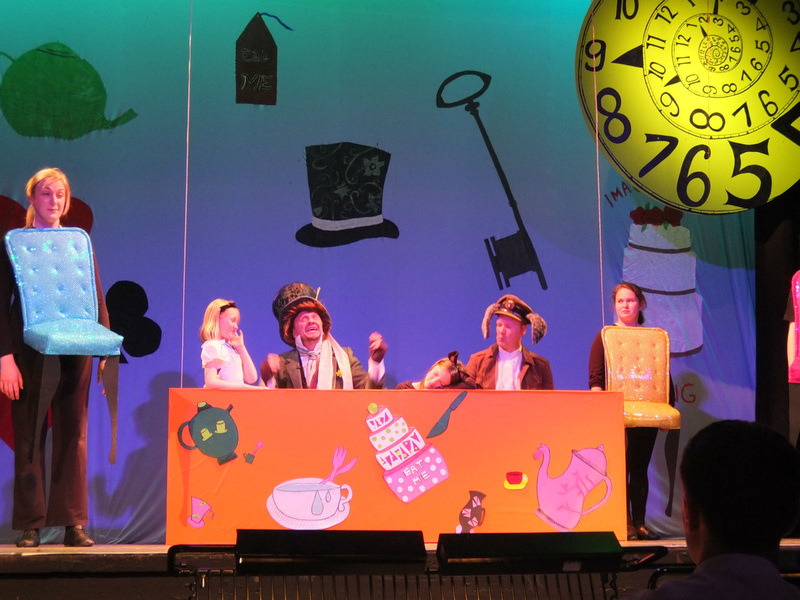 And the Mad Hatter (Paul Mason), whose foghorn-like vocals would have woken half of Yorkshire let alone the Dormouse (a suitably snoozy Eve Townsend), performed with such spirited insanity that he was embraced by the audience. The second half was livelier than the first. All that growing and shrinking is done with and we found another star of the evening in the Queen of Hearts. No stately Helen Mirren performance this. Katy Devine was nut-crackingly crazy with tantrums turned up to 11 and very funny with it. The croquet game with flamingos, hedgehogs and shuffling playing card hoops was recreated with ingenuity. Which is a cue to congratulate everyone who created the colourful costumes, props and set. The strength in depth of the supporting cast, from hopping frogs to dancing chairs, put the wonder into Wonderland. And a mention must go to Vanessa Hegarty. If you searched every branch of Pets At Home you would never find a cuter White Rabbit. Although missing a showstopper to be reprised for a rousing finale, Dennis Westgate’s songs were a mix of memorable melodies and crafty lyrics. And writer-directors Donna Riley and Charlotte Gray deserve great credit for marshalling both Carroll’s barmy story and a large and lively cast along this thoroughly entertaining road trip into the imagination.